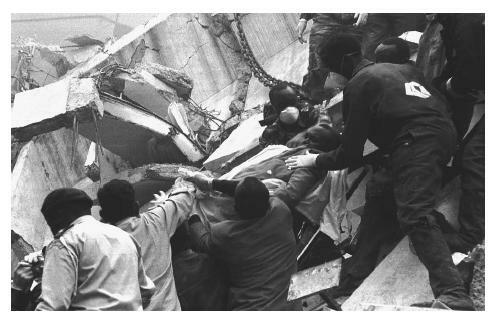 Rescue workers pull an injured man from the ruins of a neighboring building after a powerful blast detonated next to the U.S. Embassy in Nairobi, Kenya, in 1998. Islamist al-Qaeda members were blamed for the explosion, which killed over 200 people and injured over 1,600. At approximately 10:30 on the morning of August 7, 1998, a yellow van approached the United States Embassy in Nairobi, Kenya. When the vehicle stopped, one of the passengers exited and threw a grenade-like device at the gate-guard. The guard fled while the van went through the gate and proceeded to the underground parking garage. Moments later, an explosion ripped through the embassy, also demolishing the nearby Ufundi Coop House and the 17-story Cooperative Bank. A secretarial college was also severely damaged. Two hundred and fourteen persons were killed in the bombing, including twelve American citizens, and more than four thousand were injured. A near-simultaneous bombing of the U.S. Embassy in Dar es Salaam, Tanzania, killed eleven more people. Within days, the man who had thrown the grenade-like device was captured and identified as Mohamed Rashed Daoud al-Owhali. Al-Owhali had been injured in the grenade explosion and had gone to a local hospital for treatment. Under questioning, al-Owhali revealed that the operation was linked to the Arab-Afghan al-Qaeda organization run by Saudi financier Osama bin Laden. Al-Owhali claimed to have been trained in several al-Qaeda terrorist camps in Afghanistan, where he had received instruction in explosives, highjacking, and kidnapping. He had also attended conferences where Bin Laden was present, and was aware of a 1996 fatwa (religious ruling), signed by Bin Laden, that urged the killing of Americans worldwide. Al-Owhali also stated that the bombing was supposed to have been a "martyrdom operation," and that he hadn't expected to survive it. Soon thereafter, a second suspect was captured and identified as Mohamed Saddiq Odeh. Odeh, a 34-year-old Palestinian engineer, admitted that he had provided technical and logistical support to the bombers. Further investigation showed that Odeh had been a member of al-Qaeda since 1992, and had lived in Kenya since 1996, where he had been in frequent communication with top al-Qaeda commanders. He also was aware of Bin Laden's 1996 fatwa. Al-Owhali, the first suspect, was a Yemeni national who agreed to speak to authorities if he was guaranteed trial in the United States ("because America is my enemy and Kenya is not"). In his testimony, al-Owhali claimed that the Nairobi embassy had been targeted because it was a lightly guarded, "easy target." In regard to the timing of the bombing, al-Owhali testified that it had been planned for late Friday morning because observant Muslims would be going to mosques for prayer services at that time. Within weeks of the bombing, the United States responded with SCUD missile attacks on likely Bin Laden base camps in Afghanistan. Satellites had observed the dispersion of people away from these camps in the days immediately following the August 7 embassy bombings. Combined with the testimony of al-Ohwali and Odeh, these observed movements gave the United States evidence to consider al-Qaeda and Osama bin Laden fully responsible for the deadly attacks. By the fourth anniversary of the bombing, the United States had given $42 million in assistance to Kenya and four of the perpetrators had been convicted and sentenced to life in prison. Benjamin, Daniel, and Steven Simon. The Age of Sacred Terror. New York: Random House, 2002. Kushner, Harvey W., ed. Essential Readings on Political Terrorism: Analyses of Problems and Prospects for the 21st Century. Lincoln, Nebraska: Gordian Knot Books, University of Nebraska Press, 2002. The Avalon Project at Yale Law School. "Documents on Terrorism: Criminal Complaint Against Kenya Bombing Suspect Al-Owhali." August 26, 1998. < http://www.yale.edu/lawweb/avalon/terrorism/t_0024.htm > (December 13, 2002).